Calendar apps have become a must-have download in today’s fast paced digital society. Making the move from a paper calendar to a digital one might seem like a daunting task if you are unsure of which calendar app to choose. There are millions of productivity apps in the Apple app store but if you are looking for a download that will help manage your events in an efficient and stylish way then Calmighty may be the iOS app for you. 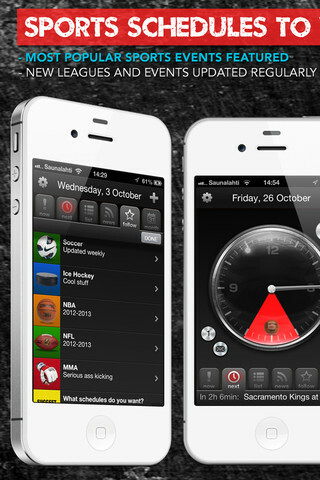 Calmighty is a gorgeous calendar app that is well designed, easy to use and integrates with Facebook. The app has a clock interface that offers its users a new and unique way to view your daily calenda r of events. The interface is set up like a traditional clock with an hour hand moving from one to twelve, and as you drag the hand through each hour of the day it will show you what events you have scheduled. Calmighty will also show your scheduled events the old-fashioned way in the monthly calendar view or even as a daily or monthly list—choose whichever view is best for you. 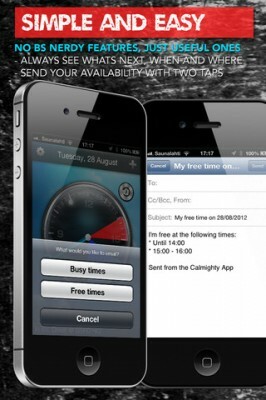 The app connects your built-in iOS calendar to Calmighty for a seamless integration between both your calendars. The app also integrates with Facebook and will automatically sync your events from the social media site straight to your calendar. The Facebook integration is an excellent feature to have and makes managing your digital schedule so much easier. For those readers who use social media as a way to manage events, Calmighty will be a welcomed new app. The design on the app is one of the best features. It is simply beautiful and stunning. Calmighty is easy to use and makes inputting events a quick and simple process – unlike other calendar apps that make the process difficult and complicated. This is an app where the user can immediately see that the developers put extra thought in the design of the interface. I have never been a fan of digital calendars as I have found them too complicated and cumbersome at times, but Calmighty has converted me to the digital calendar team, and quite frankly I don’t know how I ever survived without one. Overall, I thou ght Calmighty was an excellent calendar app that bridges the gap between your digital events that may be spread across multiple calendars. There are probably many fantastic calendar downloads in the Apple app store but Calmighty does such an efficient job of organizing your digital events that there is no need to look further in your calendar app search. Next PostNext Tablets and your pre-schooler: Is it a good idea?